I traveled Switzerland for 12 days from June to July. I went to Zurich by British Airways stopping by at London. It took around 13 hours from Narita Tokyo Airport to London Airport, flew to Zurich, got on train and I arrived at the hotel at late at night. I woke up early in the morning and enjoyed morning coffee at the open cafe looking at the street view. street car.It was a cool and beautiful morning. These are photos I took next morning in fron of the hotel. 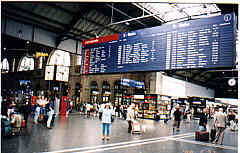 This is me at the Zurich Station. I have ever seen the TV report about train travel in Switzerland. I'd been dreaming of traveling by train in Switzerland since then. From Zurich I went to Murren by train. I stayed at Murren for five days, it was the longest stay during this travel. 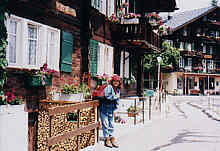 Murren was a small village at the 1650M above sea level. I enjoyed beautiful wild flowers, nice view of mountains and hiking. I enjoyed the beautiful scenery and meeting nice people. They were so kind and friendly that I could have wonderful days everywhere I visited. 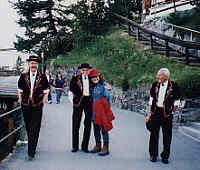 I took photos with children in front of their school and with yodel singers before their show. The weather was very fine almost every day and many of the wild flowers were in full bloom.